 Home › Politics News › Senators Abandon Their Job For 2019 Election Campaigns? 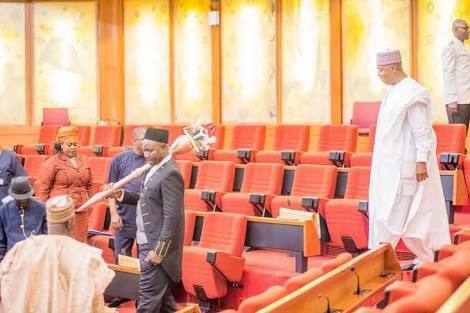 Senators Abandon Their Job For 2019 Election Campaigns? contest the 2019 general elections stayed away from plenary on Tuesday, forcing the red chamber to adjourn till next week. The chamber needs at least 37 senators to carry out legislative activities at plenary but it was observed that only 20 senators out of 109 were seated at the commencement of the session yesterday. He said, “We are less than the number required to form a quorum. Mr. President, I want to move that since we have not formed a quorum, we may therefore adjourn. “In doing so, I want to say that the senate is empty because various committees are carrying out oversight duties, they are all over the country, ensuring that the budget is performing. The Deputy Senate President, Ike Ekweremadu, seconded the motion for the adjournment, stressing that the order cited by Aduda bars the senate from carrying out any legislative duties if members are not up to 37. The President of the Senate, Bukola Saraki, put the motion to vote and members overwhelmingly backed it. Senate Leader, Ahmad Lawan, thereafter moved for the adjournment till November 20 and the motion was seconded by the Deputy Minority Leader, Senator Emmanuel Bwacha. Investigations, however, showed that many of the senators might have stayed away to enable them to carry out necessary preparations for their campaigns starting on Sunday. A former senate leader, Ali Ndume, told journalists in his office that the adjournment of plenary would continue till the end of the elections, because his colleagues would be busy with electioneering. He also explained that most of the senators decided to stay away in order to face their campaigns, because deliberations at plenary in recent times usually centre on private issues.